IoT offers tremendous possibilities, but also introduces vulnerabilities within an enterprise and across multi-enterprise business networks. As organizations continue their digital transformation journeys, the ability to collaborate securely amongst people, systems, and things becomes increasingly important and complex. Success starts with a robust, scalable, elastic identity management solution. Exostar will share how leading global life sciences companies and their vast arrays of partner networks are leveraging the Exostar identity and access management platform – honed and proven over the past decade in the highly-regulated aerospace and defense industry – to achieve this mission-critical objective..
As Chief Technology Officer at Exostar, Dipto Chakravarty is responsible for the strategic design, software engineering, and ongoing innovation of the company’s technology infrastructure, operations, and delivery. Dipto brings a diverse set of information security skills and experiences to Exostar. Dipto has a track record of success in the development and re-engineering of solutions in the security field, spanning identity management, cybersecurity, and threat remediation, among others. He possesses deep domain expertise in software-as-a-service, cloud, mobile, and Internet of Things technologies, leveraging them to drive revenue and consistently win industry awards. Dipto’s portfolio includes 11 patents, several best-selling books, and high-profile speaking engagements. Dipto comes to Exostar from CA Technologies, where he was Senior Vice President and General Manager of its core security IAM business unit. At CA, he also served as Senior Vice President of Engineering, with oversight of the company’s cybersecurity product lines. Prior to CA, Dipto held executive positions at ThreatTrack Security, Novell, and Thomson-Reuters. 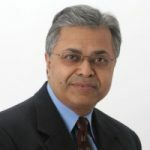 He began his career as a software engineer at IBM and Bell Labs after graduating with undergraduate and graduate degrees in computer science from the University of Maryland.